Annapolis is the capital of Maryland and home to the United States Naval Academy. Our military personnel are constantly on the go, so there are plenty of vehicles being shipped through Annapolis. Our Maryland car shipping rates help tremendously. 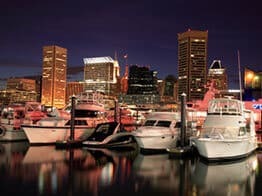 Baltimore is the largest city in Maryland and known for a number of things including their delicious crab cakes and sea food. It is also the home to The Preakness Horse Race. Crowds swarm Pimlico Race Course in Baltimore every 3rd Saturday in May to experience the highly regarded horse racing event, which is the second leg of the triple crown. Baltimore also prides itself on its famous athletes such as Cal Ripken, often referred to as “The Iron Man,” because he broke Lou Gehrig’s record for consecutive games played. Baltimore has also been home to football champions Johnny Unitas and Ray Lewis. With so much going on in Baltimore, it is an ideal place for auto shipping because it is not too hard to amalgamate a full load. Maryland is also called the Chesapeake Bay State. Here, you will find the largest estuary that is known to the United States, and it is positioned between Maryland and Virginia. This body of water stretches across two hundred miles and covers 64,299 sq. miles overall. Over a hundred plus rivers flow into the bay from other New England states and Washington D.C.. While western Maryland is kind of out there all by itself and seemingly more like West Virginia than the rest of the state, the more urbane Baltimore and Silver Springs areas are ideal for auto shipping. Several interstates connect between Baltimore and Washington. I-70 begins in Baltimore and is a straight shot clear across America. I-95 runs up the east coast and right thru Bethesda, Rockville, Towson and Baltimore. Even I-83 heads to Baltimore. So there are plenty paths for an auto transport carrier to get in and out. So the elephant in the room is across Chesapeake Bay to the sparsely populated east side of Maryland that butts up against Delaware. Let’s be honest, it’s a pain shipping a car in or out of there. It almost always takes longer. Usually you have to get a little bit lucky to have something happen fast there, or pay more to entice an auto shipper to do it. Whether you are headed to Baltimore, the D.C. area, or others, our Maryland car shipping service can really help. If you have questions about car transport your vehicle, feel free to contact us by dialing our toll free number (800-600-3750). You can also visit Direct Express Auto Transport to fill out a simple form and get a free car shipping quote. We make it easy to book your vehicle shipment online.